Los Lobotomys – Our Story | Los Lobotomys - The Official Site | World renowned instrumental band, playing everything from hard rock to be-bop, with a strong focus on improvisation. Any story about Los Lobotomys must begin with The Baked Potato, affectionately known as ‘The Spud’. It’s a jazz club and restaurant located on Cahuenga Boulevard in North Hollywoood, California, in the heart of Studio City. It’s a small and intimate club with a low ceiling and candle lights, serving the unusual combination of jazz music and baked potatoes, and for decades the club has attracted visitors from around the world to experience some of the best musicians around Los Angeles. Many artists started performing here at the beginning of their careers and many keep coming back, and together with the new upcoming talents, this venue is a regular melting pot in the L.A. music scene. Los Lobotomys was basically born as an off-shoot of Karizma, a band that had already been playing at The Baked Potato for years. Although the two bands would share a few of their members, this new group would musically be quite a different entity. Karizma was playing more original music in the style of west coast, with elements of jazz and latin and with vocals. Los Lobotomys would be an instrumental band, playing everything from hard rock to be-bop, and always with a strong focus on improvisation. Guitarist Steve Lukather had played on Karizma’s album and wanted to play with the band in a live setting. He eventually sat in with the band at the Baked Potato on a gig billed as David Garfield and Friends. After a few gigs in 1985, Lenny Castro came up with the name Los Lobotomys (inspired by L.A. based Los Lobos) and the first appearance of this group featured Jeff Porcaro, Lenny Castro, Nathan East, Brandon Fields, Steve Lukather and David Garfield. Los Lobotomys started playing at The Baked Potato on Tuesday nights and soon, lines would form outside the club many hours before the show. People from all over the world came to North Hollywood to experience the group and, not least, Jeff Porcaro’s magical grooves. In 1992, tragedy struck the band and the entire music world when the legendary drummer Jeff Porcaro passed away. As with Toto, Simon Phillips would join Los Lobotomys and fill in the drum chair. Though Los Lobotomys was a fairly large group in the beginning – the first album featured nine musicians – the band was cut down to a four-piece (Steve Lukather, David Garfield, Simon Phillips and John Peña) prior to the recording of the Candyman album and the subsequent world tour in 1994. This was the V2 version of the band. The band would remain a four-piece for the next ten years, although being dormant for most of this period. During this time, Steve and Simon went on to pursue their own personal endeavors thus leaving those vacancies to be filled. And so, like Karizma, Los Lobotomys has had many incarnations. But even more than Karizma, Los Lobotomys was an open group from the beginning, basically a community of friends wanting to play live music. Since the first gig at The Baked Potato in 1985 – with the core group consisting of Jeff Porcaro, Lenny Castro, Nathan East, Brandon Fields, Steve Lukather and David Garfield – Los Lobotomys was not a fixed configuration. The band would invite musicians who happened to be in town, and through the years artist like Carlos Vega, Joe Sample, Vinnie Colaiuta, David Sanborn, Greg Bissonette, Sheila E., Marcus Miller, Larry Carlton, Slash, Pat Travers, David Paich, Bobby Kimbal, Alex Acuna, Kevin Ricard, Chad Wackerman, Steve Tavaglione and many others appeared as guests on the Los Lobotomys live bill. To illustrate, when the time was to release their first album in 1989, both Nathan East and Abraham Laboriel subsequently had to cancel because of other engagements. Will Lee, originally offered to be in Toto as a replacement for David Hungate, was on a break from David Letterman’s show and went to L.A. to record the album. Although Los Lobotomys would be reduced to a four- piece in 1994 in support of the recording and subsequent tour of Steve Lukather’s solo album, the concept of Los Lobotomys as a community would live on, although subdued for a while. That is why you might find it hard to distinguish members from friends, when you think of the entity as a band. It’s a community. The music of Los Lobotomys is not easily described, as it blends styles such as rock, blues, jazz, latin, reggae and much more, sometimes in the same tune..
David Garfield recalls: “We were known for being crazy and wild, and we played long songs, intense solos and very hard rock flavored jazz things. What is common for both recorded and live performances is the quality of musicianship, no matter who’s in the band at a given time. Even more than the recorded music of the band, the live version of the music is characterized by rather lengthy songs with rehearsed beginnings and ends, and very creative middles with improvisation and solos. In much of the 90s, the band was a four-piece and this naturally had an effect on the sound: ‘For me the sax always gave us the jazz thing, the percussion gave us the Latin thing and the guitar gave us the rock thing. So it got a little bit focused on the direction of a more rock, fusion kind of a group for those few years, and then Steve Lukather moved on with various projects of his own, so the natural thing to do was to bring in some different guitar players as guests. In 2008, David invited 2 guitarists to play some of the Lobotomys music live…due to scheduling conflicts it was Doug Bossi that wound up playing a few gigs around town during this period as the lone guitarist. It was at this time the decision was made to write a new record of material to honor the legacy of this amazing band. Doug was asked to invite some of his favorite guitarists and the new CD will feature guitar icons Scott Henderson, Guthrie Govan, Tim Miller, Frank Gambale, Joe Bonamassa, Robben Ford and many others. 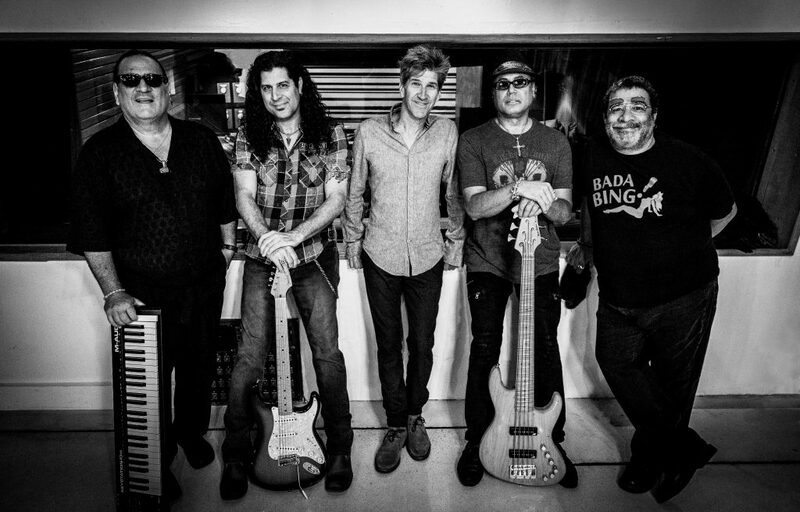 The new V3 lineup now includes the incredible Chad Wackerman on drums, Lenny Castro on Percussion, John Peña on bass, David Garfield on keys and Doug Bossi on guitar. Los Lobotomys is currently finishing the new studio album and will be released in the Fall of 2018. It will feature tributes to the late great Stevie Ray Vaughn, Michael Brecker, Allan Holdsworth as well as Paco DeLucia. Come get Lobotomized with the new music coming soon!